This Course has been viewed 2097 times. There is always a way out of any difficult situation. There is always hope and the opportunity to resolve problems and find direction. You just need a better understanding of yourself and life, plus a small shift in attitude and thinking. The Tarot helps you to do this. A fascinating and enjoyable course! The Tarot shows different paths we can take in any situation, and demonstrates the potential we have of achieving well-being, happiness and success, often through just a small change in our thinking, attitude and perception of our situation. 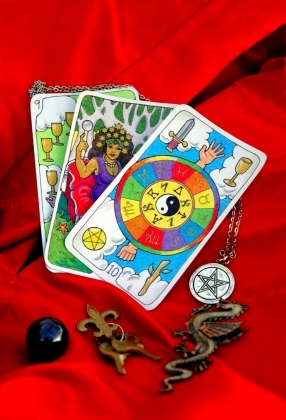 The Tarot is not mysterious or weird. We work with our own inner knowledge, wisdom and awareness to find direction in our personal confusion by knowing the different options and trends in our life. We can gain a fresh perspective and see a way through our challenges. It’s not difficult to read the Tarot. Whether for yourself or for others, all you need are basic techniques and lots of practice. The course teaches how to read the cards confidently, what intuition is and how to develop sensitivity to the energy around you and the significance of the cards. Each card is like a window through which you can observe life and gain an understanding of yin and yang forces necessary for total balance in yourself and in what is happening around you. With balance come optimum conditions for everything to work well again - ­ health, well-being, situations, life, relationships and more.